CMMG 55AE160 M4LE WASP-Treated Barrel SA 223 Rem|5.56 NATO 16 30+1 6Pos Stk Blk in. 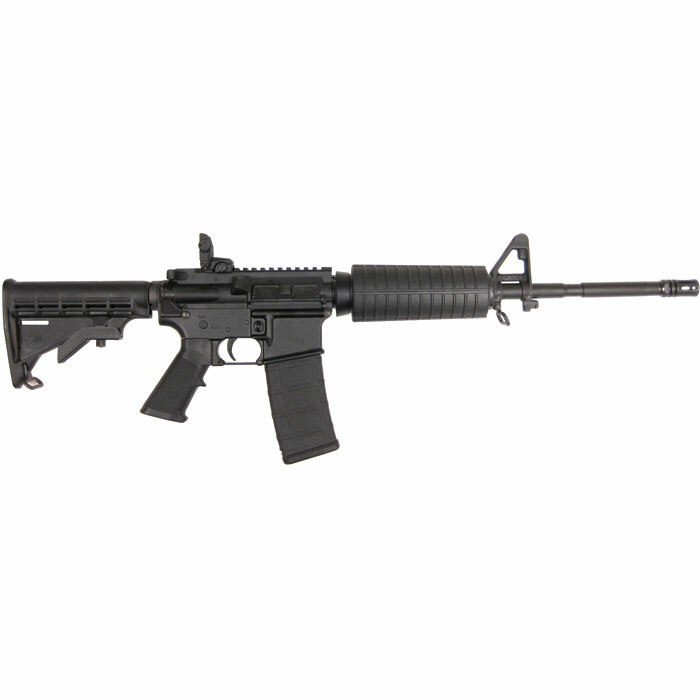 This M4LE rifle is Weapon Armament Surface Protection WASPtreated to improve wear abrasion and corrosion resistance. This nitriding conversion is applied to the barrel inside and out along with the front sight base on LE rifles and upper for improved wear abrasion and corrosion resistance without the risk of dimensional build up. The 16 WASPtreated 4140 chromemoly steel barrel has an M4 Profile and a 19" twist and a M4 handguard. The rifle has 4lb. forged upper receiver. The forged lower receiver is RDIASRLL compatible. Rifle has an "F" marked front sight base Magpul MBUS rear sight 6position stock. Rifle weighs 6lbs. without the included 30rd PMAG. It includes a MilSpec lower parts kit .250 takedown and .154 FCG pins. Each rifle is head spaced and test fired."